Yesterday the BBC published data showing more people accessing iPlayer via tablet than via computer. This prompted me to update some of the data I gathered for the government’s agreed approach to mobile last this time last year. The objective of the UK government’s digital strategy is to make sure our digital services that are so straightforward and convenient that all those who can use them will choose to do so. But what our users consider to be ‘straightforward’ and ‘convenient’ is far from static. We need our services to be able to adapt quickly to potentially quite profound changes in people’s behaviours and expectations. Since 1 January 2014, 63% of visits to GOV.UK have come from a computer, 23% from a mobile and 14% from a tablet. 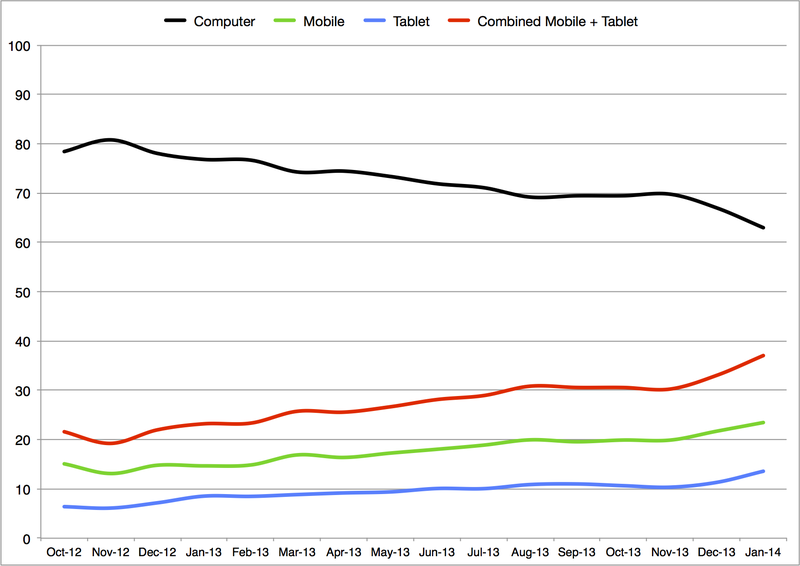 In January 2012 it was 77% computer, 15% mobile and 9% tablet. If you visit the GOV.UK performance dashboard you’ll see that the sample sizes are non-trivial. I’ve tried to get more representative UK data by looking at the visit data for the two weeks following Christmas Day, when such power users are probably not quite so busy. The device breakdown for this period last year was 74% computer, 16% mobile and 10% tablet. This year saw 61% using a computer, 24% mobile and 15% tablet. Such a shift in the devices people use to access the internet should come as no surprise, but the pace of change might. And I do not expect this switch away from PCs towards more personal, portable, touchscreen devices to slow down anytime soon. Designing for small screens can be a real challenge. Which is why for many of the 25 exemplar services we’re now designing the mobile version first, despite visits from computers still being in the majority. Why? Simply, it’s often easier to make a service also work for a computer monitor and keyboard if you’ve already made it work really well on a small touchscreen than it is to go the other way. NB I’ve seen no data over the past year to suggest the government’s approach to downloadable apps should change. We’re still not ‘appy about them, and central government departments and agencies must seek an exemption before they start developing any. Posted on January 8, 2014 by Tom Loosemore. This entry was posted in GDS. Bookmark the permalink.